Überlingen - For the 25th time, the TOP 100 Competition is honoring Germany’s most innovative medium-sized companies. This year, one of these innovation leaders is DriveLock SE, the specialist for IT and data security. This was the result of the analysis conducted by the scientific director of TOP 100, Prof. Dr. Nikolaus Franke. 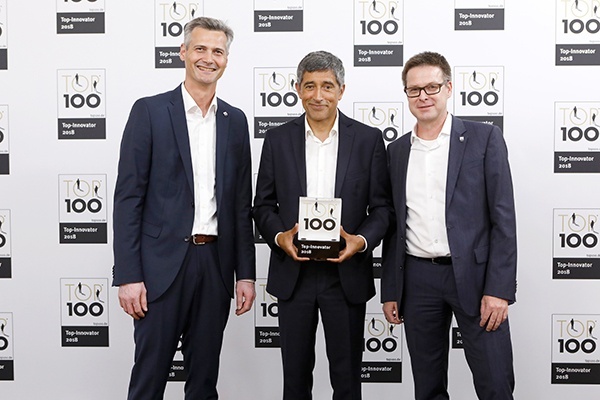 As a mentor of the TOP 100, Ranga Yogeshwar is honoring the company from Munich together with Prof. Franke and compamedia on June 29, 2018 at the award ceremony in Ludwigsburg in the context of the 5th “Deutschen Mittelstand” Summit. DriveLock already made the leap into this innovative elite for the third time. During the independent selection process, the company with 50 employees was particularly convincing through its climate of innovation. Cyber attacks on computers and networks don't just affect banks anymore, but also manufacturing companies, public authorities and governments. This is where DriveLock SE, which was founded in 2000, is able to fully demonstrate its capabilities, because the three-time top innovator is one of the internationally leading specialists for IT and data security. The IT experts have made a name for themselves throughout the world with their "Endpoint Protection Platform". This solution has an effect similar to city walls in ancient times: DriveLock creates several security rings around the data to be protected, which then serve as a protective wall against unwanted Intruders. The top innovator, who is headquartered in Munich, also developed the "DriveLock Smart AppGuard": This software utilizes artificial intelligence to predict the harmful effect of new files, and only authorizes program files when all the security criteria are met. The development of solutions like this also facilitated by the fact that the 50 employees can perform their development tasks in an open innovation climate. They regularly integrate their assessments and solution approaches gained from current developments from the security industry into the products they create. Through this, the TOP 100 company guarantees that the DriveLock Endpoint Protection Platform is always innovative and cutting edge. DriveLock also offers an extensive training program. This ranges from a general introduction to IT security, through the securing of mobile devices and working in the cloud, all the way up to a compliance with legal regulations such as data protection regulations. Since 1993 compamedia has awarded the TOP 100 seal to medium-sized companies which exhibit an exceptional innovative strength and an above-average degree of inno-vation. Since 2002, the scientific management has been in the hands of Prof. Dr. Nikolaus Franke. Franke is founder and director of the Institute for Entrepreneurship and Innovation at the Vienna University of Economics and Business Administration. The mentor of TOP 100 is the science journalist Ranga Yogeshwar. Project partners are the “Fraunhofer-Gesellschaft zur Förderung der angewandten Forschung” and the BVMW.